Up, up, and away! The high-flying Green Toys Helicopter is ready for action! This eco-friendly chopper is made in the USA from 100% recycled plastic milk jugs that save energy and reduce greenhouse gas emissions, and features two spinning rotors and sleek skids on the bottom for easy landings. 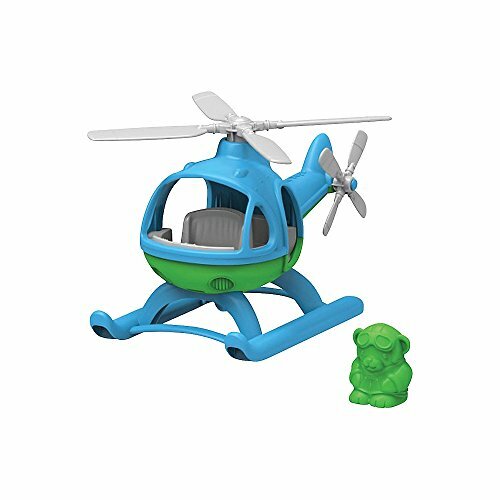 The Helicopter includes a pilot bear figure that fits perfectly in the spacious cockpit that's complete with a full dashboard and the Green Toys' signature 8-track. No BPA, phthalates, or PVC. Dishwasher safe for easy cleaning. Packaged with recyclable materials and printed with soy ink.